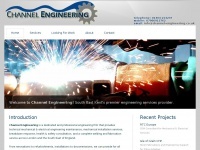 Channel Engineering provides first class mechanical & electrical engineering services across South East England. Based in Kent and with over 30 years of experience, our expertise includes Steel Fabrication, Health and Safety Consultation, Industrial Facilities Maintenance, Waste Disposal, Civil Engineering and Steel Construction. The websites creator or author is Luke Clark. The web server with the IP-address 217.160.0.168 used by Channel-engineering.co.uk is run by 1&1 Internet AG and is located in Germany. There are many websites run by this web server. The operator uses this server for many hosting clients. In total there are at least 122 websites on this server. The language of these websites is mostly english. A Apache server hosts the websites of Channel-engineering.co.uk. XHTML 1.0 Transitional is used as markup language on the webpages. To analyze the visitors, the websites uses the analysis software Google Analytics. Indexing the data of the website and following hyperlinks on it is explicitly allowed by robot information.